A retired medical doctor who also spent a number of years golfing and traveling has published a book on his experiences. Dr. George Kitchens’ “Golfing Across the Ponds: A Duffer’s Perspective” is not a platform to brag about his course accomplishments around the world. Rather, part of the book’s title is a clear indication for what’s to follow. “A Duffer’s Perspective” puts things into perspective. Though the author is a duffer at heart, he still enjoys the game immensely, and the book reflects that as well. “Golfing Across the Ponds” summarizes Kitchens’ more than 60 years of travel experiences in pursuit of his passion. He’s golfed at 546 courses and counting, at exceptional courses in Ireland, Scotland, England, Europe, the Caribbean, Mexico, New Zealand, Australia, and of course, the United States. At 73, he still actively pursues the game he’s enjoyed most of his life. In all, Kitchens has teed it up in 26 states and 14 countries, traveling to Scotland seven times, Ireland six times, with three visits to England. Kitchens is a decent golfer, or at least he was at one time. His best handicap was a 13, but that number has slower increased with age. The author’s all-time favorite golf courses include Pine Valley in New Jersey; Cypress Point in California; Royal County Downs in Ireland; Wade Hampton Golf Club in Cashiers, NC; and Augusta National, home of the Masters Golf Tournament in Augusta, Georgia. Kitchens grew up in the shadows of Augusta National, 35 miles down the street. In fact, this year marked his 61st trip to the Masters. On the book’s website, renowned golf course architect Tom Fazio says, “I can say without hesitation that George Kitchens has seen and experienced infinitely more golf around the world than I ever will.” Fazio, who also designed Wade Hampton Golf Club in Cashiers, NC, wrote the book’s forward. 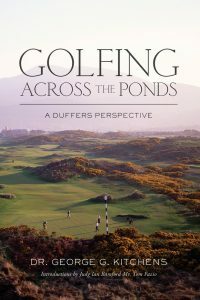 With lots of travel details and humorous recollections, Dr. George Kitchens’ “Golfing Across the Ponds: A Duffer’s Perspective” is 258 pages of entertainment, good for a rainy day when you’re confined to your RV. You can find the book available on Amazon.